Proper irrigation and proper drainage are crucial for maintaining beautiful and healthy landscaping. If water pools in areas of your yard, you might need to explore the drainage options available to you. At Harford Tree Experts & Landscaping, our experts can outfit your yard with swales, drains, or proper grading to ensure your plants stay properly watered and your home stays dry. Swales are shallow trenches placed along the contour of your residential property to catch excess water, move it away from your home, reduce erosion, and irrigate your garden and landscaping. Swales work by slowing the flow of water and distributing along the contour of your yard to keep everything equally watered and not flooded. Even if you don’t have a steep hill on your property, you can still benefit from a swale. French drains are a very popular option for homeowners seeking better drainage in their yard. French drains are large trenches filled with gravel that can redirect the flow of surface and ground water to avoid flooding. Curtain drains work beautifully in yards where the street is below the grade of your property. They consist of pipes that draw in water, using the natural power of gravity, and pulling it away from your home into the appropriate place. If you don’t have the proper grading around your home, many different drainage solutions might not even make a difference. If you have water pooling around your foundation after a rain, get your home up to grade! Our pros will assess your home and create an appropriate grade around your foundation so that water flows away from your home instead of towards it. If you notice drainage problems suddenly appearing after spring showers, a quick fix to your grading might save you money on more costly drainage solutions. Residential Landscape Drainage Services from Harford Tree Experts & Landscaping, Inc.
Harford Tree Experts & Landscaping, Inc. offers all of our valued customers the quality work, quick response, and reasonable rates that they need. Our skilled workers can take care of all your landscape drainage needs, in addition to residential tree removal services, stump grinding and stump removal, and more. Our professionals are available 24/7, because we know that storms don’t always strike during business hours. 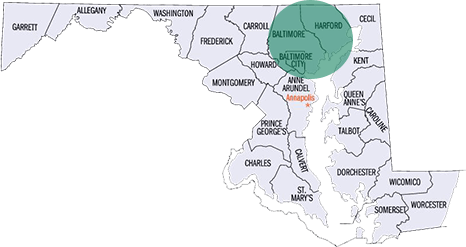 We service the Harford County, Baltimore County, Baltimore City areas including Bel Air, Fallston, Perry Hall, Towson, Essex, Parkville, White Marsh, and Middle River. For service during business hours, contact us or give us a call at 410-592-7321. For 24/7 emergency service, please call 443-250-6649.